In 1908 Motor Age reported, "The Cedarhurst Motor Livery Co., of New York city, has been incorporated with a capital stock of $10,000, and will operate a motor livery and boarding stable." Earlier the same year The Horseless Age listed among its New Incorporations, "Cedarhurst Motor Livery Co., New York - Capital, $10,000. Directors, Peter T. Radiker, Nellie F. P. Radiker and Mary C. Pease." Another account in the same issue of The Horseless Age reported, "The Cedarhurst Motor Livery Company, of 147 West Eighty-third street, New York city, has been recently incorporated to operate a taxicab service with Frayer-Miller cabs. This service will be of a private nature, no business being done from stands. At present they have five cabs in operation, and expect to have twenty more in use by the first of September. ..."
This ad for the Cedarhurst Motor Livery Co. appeared in the catalogue of the Twenty-fourth Annual Horse Show at Madison Square Garden, New York, November 9 to 14, 1908. Presumbably business went well. The Real Estate Record and Builders Guide, 4 June 1910, p. 1201, described alterations at the Cedarhurst garage: "83d St, Nos 141-147 West, alter elevator shaft, to 4-sty brick garage; cost, $1,000; owner, Cedarhurst Motor Livery Co., 141-147 West 83d st; architect, J. Odell Whitenack, 231 West 18th st. Plan No. 1361." The original owners of the Cedarhurst Motor Livery Co. were Peter T. Radiker (1865-1921), his wife, Nellie F. Pease Radiker (1866?-1948), and her mother, Mary C. Pease (1843-ca.1940). 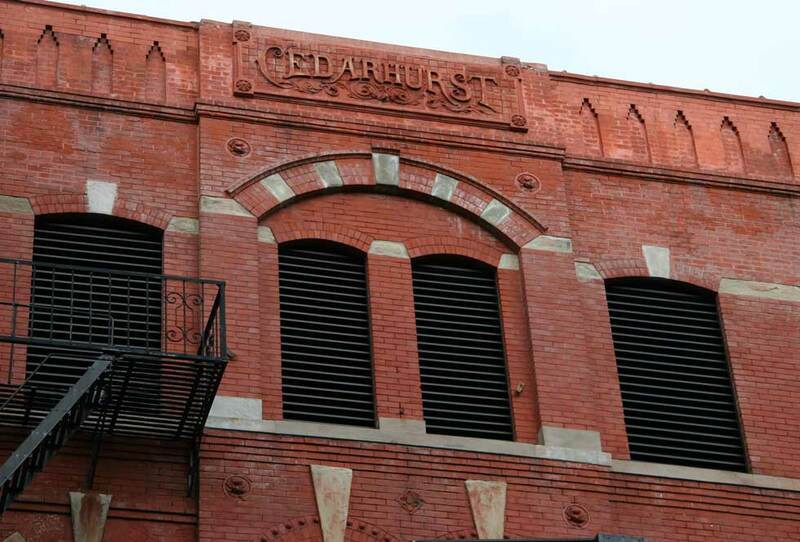 The Cedarhurst Motor Livery Co. was preceded by the Cedarhurst Boarding Stables at 147-151 W. 83rd St. The first listing in city directories is 1892. The building, then, had sixteen years use as a stable for horses before its conversion for motor vehicles. Presumably the inscription at the top dates from construction in the 1890s. A 2013 master's thesis by Hilary Grossman (available on the internet at academiccommons.columbia.edu) does not discuss the building's origins but does include, "In 1922, the building was leased as an auto service and repair shop by Francis Sheridan. He made multiple alterations to the interior of the building." Cedarhurst began to be listed as CedarHurst Garage in 1918 and retained this name through 1976. It then became J P R Parking and a little later Pleasant Parking Garage through 1996. By 2002 it was part of the Kinney System.